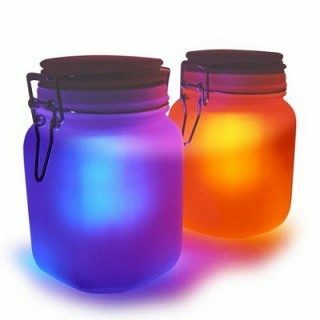 Solar Jar Light by Fine Life Just $14.99! Down From $40.00! You are here: Home / Great Deals / Solar Jar Light by Fine Life Just $14.99! Down From $40.00! 13 Deals has this Solar Jar Light by Fine Life on sale for $14.99 (Reg. $40.00) or 3 for $29.97 + FREE shipping! Add some colorful light to your garden, patio, window sill or anywhere else with this whimsical Solar Jar Light! At night this Sun Jar lights up automatically and in the daytime your Sun Jar charges while outside or in a sunny window! A switch under the jar’s lid lets you choose between warm light CH2 or cool light CH1 OFF mode where it charges only. Inside the jar is a highly efficient solar cell, rechargeable battery and LED lamp. When the jar is placed in sunlight, the solar cell creates an electrical current that charges the battery over the course of the day. This energy is then used at night to power the LED lamp inside the jar. The light emitted is diffused by the frosted jar and gives the appearance of sunlight. Sun Jars work best in DIRECT sunshine!